Coriolanus blends the old language of Shakespeare with the up-to-the-minute setting of Europe in crisis being presented on flat-panel HDTVs. The movie has the benefit of a wonderful cast — including director Ralph Fiennes as the title character. There are hints at deep and interesting ideas in the subtext, but they aren’t fleshed out enough to let Coriolanus really stand out. One of William Shakespeare’s lesser known works, Coriolanus is set in Rome. Coriolanus is a military figure that the politicians of his day prop up as their candidate for high office. On the battlefield, Coriolanus is bloodthirsty and unstoppable, and he holds a grudge pretty tightly. But as a politician, he’s unpolished and uncomfortable. Two members of the opposing party lay a trap for him that works perfectly. Through their machinations, they get Coriolanus banished from Rome. In the final act, Coriolanus bands together with a former enemy to take his revenge on his former homeland. The production design is very modern, to the point that chorus roles go to TV news anchors, remarking on current events in 16th-century prose. Battles for Rome take place in urban neighborhoods, street by street, fought by soldiers in modern camouflage uniforms. The novelty of the language blended with modern settings is one of the most enjoyable components to Coriolanus. As the antihero, Fiennes is scary and creepy. His blood-coated bald pate reminds you of the evil of Lord Voldemort. And when he tries to make nice with “the people,” his failed attempt at warmth is even creepier than the Noseless One. Jessica Chastain again plays the good wife to a man with a temper — she even has the same look and hair that she wore in The Tree of Life. Vanessa Redgrave plays the other woman Coriolanus’ life — the proud, conservative matron whose first concern is family loyalty and honor. Gerard Butler drags his Scottish brogue into Rome’s environs, perhaps to make him sound different. After all, he is Coriolanus’ battlefield nemesis and thus serves as a contrast and foil to the protagonist. Brian Cox is Coriolanus’ political mentor. The film’s Shakespearean dialog sounds most natural and comprehensible when it comes from Cox. For a movie that features explosions and modern urban battles, Coriolanus can be very slow and dry. The most notoriously slow scene is placed near the film’s climax as Coriolanus’ mother tries to convince him to come back to Rome and forge a truce. For minutes on end, she monologues while Coriolanus and a score of his men stand by and watch. Coriolanus could have benefitted from a more thematic connection to modern times. I almost grasped something in Redgrave’s performance — a genuinely conservative matron with a rock-solid worldview that comes out in her interactions with her son. In contrast, the Roman senators are playing a mere game. When mother speaks, it is about ideas and moral imperatives. When the political advisors speak, it is about political tactics. In my country, there is a relevant story here — about the politics of ideas getting lost in the noise of “politics.” But the glimpse of subtext fades quickly as the surface-level story takes over again. One of my favorite film adaptations of a Shakespeare play is Ian McKellen’s Richard III, which imagines a Fascist Britain in 1941 with the crooked prince gunning for power a la Adolf Hitler. 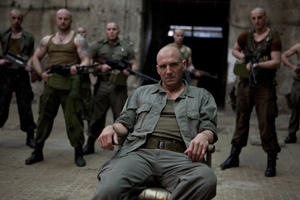 Fiennes and screenwriter John Logan attempt something similar, giving Coriolanus a modern setting and a creepy antihero. But dry patches and missed opportunities don’t let it rise to McKellen’s level.